Our whole family collects records, so when we see crates and boxes full of them at rummage sales we’ll often make an offer for a deal on the whole lot. Of course, when you do this, you often end up with records that can’t be enjoyed. 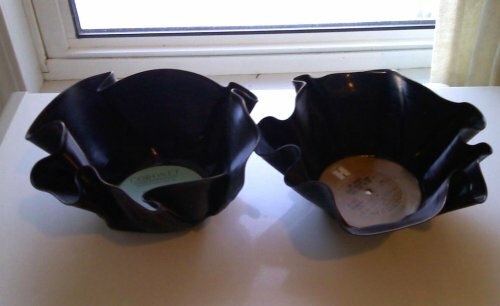 If the records are scratched, or have schmutz on them and cannot be played, we like to do the old melt the old vinyl records into bowls dealio. (Note: This is to be done with vinyl records, not varnished or shellacked records; avoid 78 RPMs. Also, the “more flimsy” the vinyl, the less time required to melt it, so keep an eye on them in the oven.) It’s a great project to do with children; as long as they are supervised and using hot pads, it’s safe. But after you’ve made some bowls to put odds and ends in, and some planters, you might feel like you’ve exhausted the possibilities — but you’ve still got stacks of damaged records to deal with. What else can you do? For one, you can simply change the shape. These shapes lend themselves to other uses, such as desk top organizers. (I have several on my desk holding my pens and pencils, vintage postcards and other ephemera I haven’t organized yet, etc.) 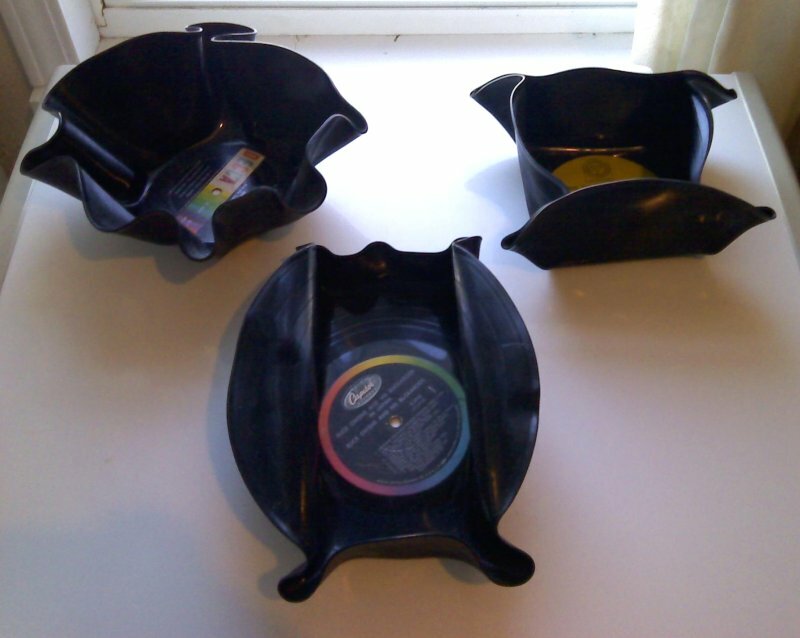 But one of the more fun things to do is to use these newly-minted from melted-records trays as holders for plastic party ware. 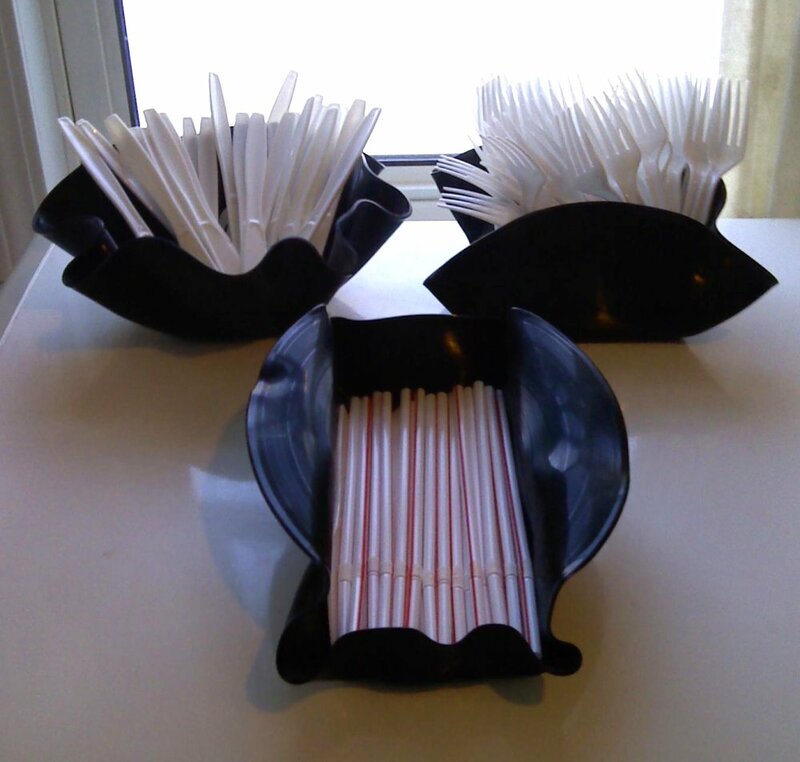 These recycled pieces are a fun way to hold plastic utensils, straws, napkins, etc. at parties. And, because they are vinyl, they are really resistant to breakage from clumsy party attendees, yet light-weight enough to be easily carried where needed. Plus, you’ve got to do something with the damaged records, right? I know some collectors will find this inherently evil, but I like to use my collectibles. In fact, one of my favorite things about the holidays is using my vintage glassware. One of our family traditions is to stay home with the kids on New Year’s Eve and have a party. A geeky party, filled with nerdy retro boardgames, vintage vinyl playing on the record player, and party food, of course. Most commonly our party snacks consist of cheese, sausage, crackers and whatever holiday cookies we have left over. And then there’s my punch — simple mix of orange juice and white soda — served in my vintage Anchor Hocking punch bowl set . 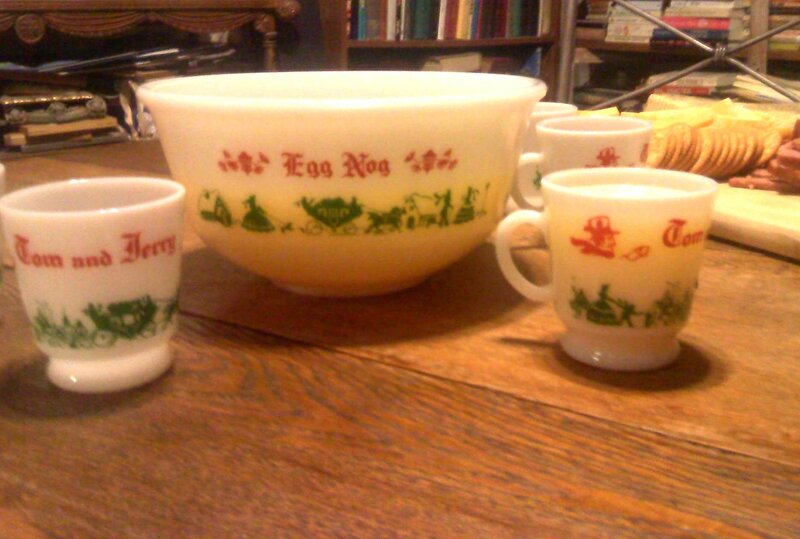 This vintage milk glass set, a punch bowl with its misleading red and green proclamation of egg nog and cups falsely declaring individual spiked Tom & Jerry servings, is something special that marks the occasion — and hopefully adds to the memories. I know that using such glassware has it’s risks. Every glassware does, and vintage pieces would be even more difficult to replace. But I treat the vintage glass set well. 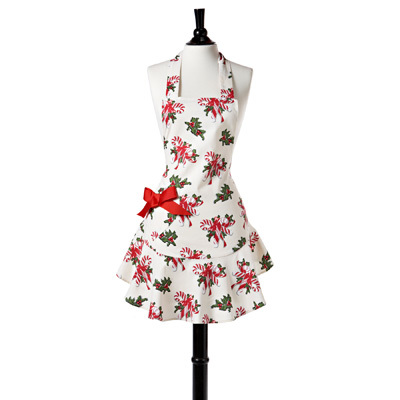 I carefully wash and dry each piece by hand — caressing it clean, anticipating the fun of using it. I carefully fill the punch bowl and serve the punch into each vintage milk glass cup, and as I place them into hands that eagerly await them I, like all mothers, remind even those with large strong man-hands to be careful with our special old friends. 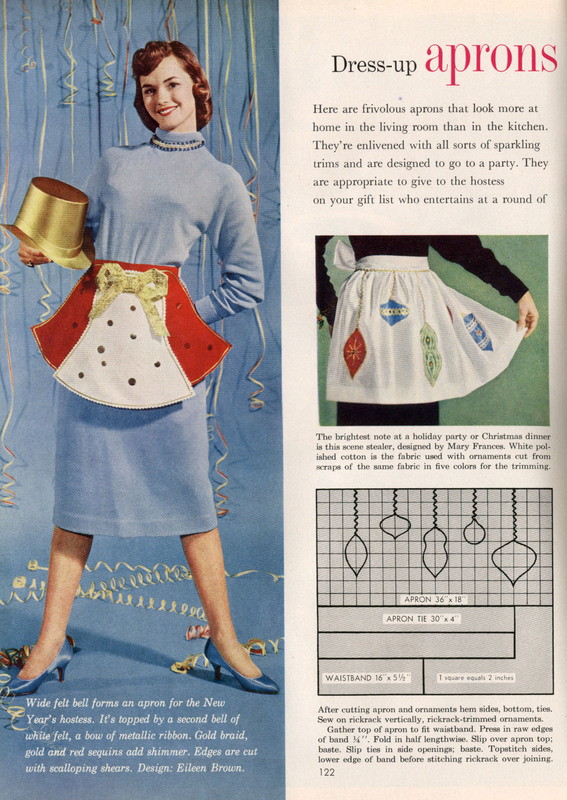 When all is done, I caress clean each piece in the vintage holiday punch bowl set again, slowly saying thank you and goodbye… Then I place the set carefully up above the kitchen cabinets, where it awaits next year’s use. The set is visible above the cabinets — should someone want to crane their necks to look — but I find that’s not enough adoration and attention for such cool vintage pieces.